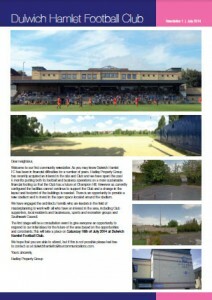 The new owners of Dulwich Hamlet Football Club, Hadley Property Group, have sent out newsletters inviting local residents to an exhibition about their plans for the club and surrounding area. This event will take place on Saturday 19th July 10 – 3pm in the Dulwich Hamlet Football Club. It’s important that people attend this event as there have been proposed plans in the past to encroach onto the Greendale Fields, which is Metropolitan Open Land. Local people have expressed a wish in the past for the lease of the Greendale Fields to be returned to the council, therefore opening up the possibility of retaining it as a wild nature reserve with some minimal management. The club have enlisted the help of PR company Four Communications (run up by Steve Lancashire and Jeremy Fraser, both ex-Southwark councillors) and Farrells architects. Locally there is some interest in setting up a ‘Friends of Greendale’ group and so if you would be interested in joining such a group, and indeed in playing an active role (it will need chairing and to have a number of people on the committee), please could you indicate this to Jonathan Coe by email in the first instance (greendalegardens@gmail.com). There’s lots to say about all this but probably best to wait until the plans have been seen on the 19th. Please come!